FOOTBALL IN INDIA IS GROWING ALL THE TIME. Right now, the place is abuzz with anticipation ahead of the Under-17 World Cup finals which are set to kick off in October, and there are even plans afoot for the country to host the 2019 Under-20 edition in a few years’ time, if everything goes to plan. It all means that the All India Football Federation (AIFF) are keen to promote football across the country and inspire fair-weather fans to become die-hard followers of the beautiful game, to grow the fan base and showcase India as a destination where the marriage of exciting football and pragmatic development that benefits the overall game can happen. It’s important work and is aiming to transform football in India from an entertainment spectacle into something tangible and constructive people can get behind. 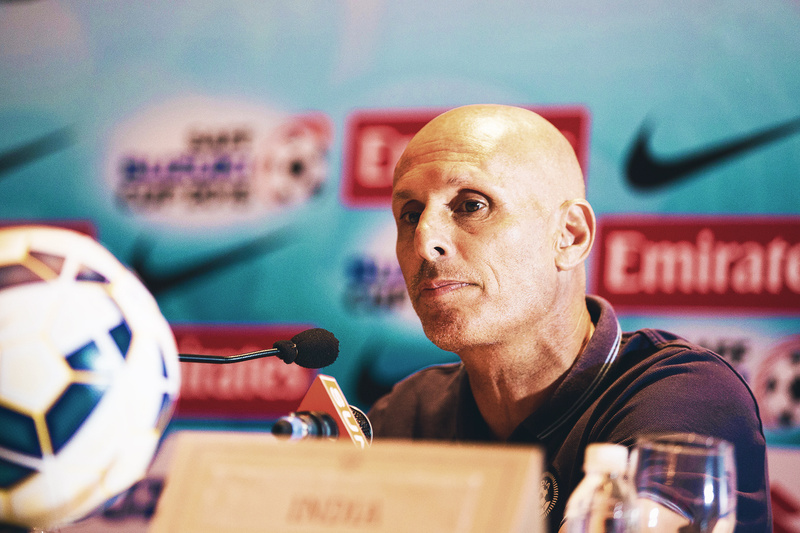 The powers that be have been assembling a reliable structure over the last few years and much of that work started with the reappointment of Stephen Constantine, the India national team coach who has been busy edging his team up the FIFA rankings. Getting his side playing some exciting football and making progress on the pitch the only way an experienced coach like him knows how, the manager has his sights firmly fixed on a record-breaking milestone. Constantine is one of England’s most well-travelled coaches, having managed five national teams in his career to date, a remarkable number of appointments that hasn’ t been paralleled by any other Englishman. It’s safe to say that the Blue Tigers are in safe hands – anyone who can play the most influential role in lifting a team over 80 places in a few years deserves enormous credit, after all. When I caught up with Constantine for These Football Times, he made no secret of his desire to keep improving the national team’s fortunes. Coming through loud and clear in his answers was self-evident confidence fused with a level-headed coolness that ought to leave no Indian football fans with any uncertainty about which way the current side are heading. 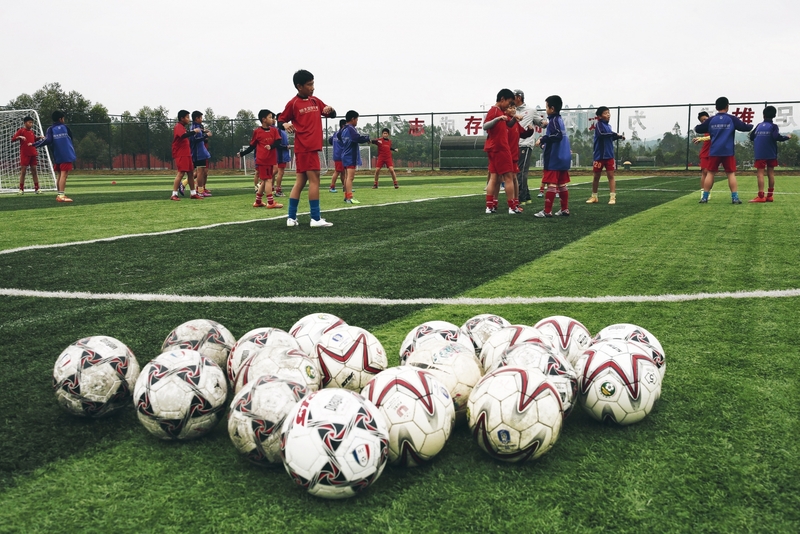 Kyrgyzstan and Myanmar might not be the most glamourous of opponents, but they are nonetheless difficult opponents to overcome in a qualifying playoff round atmosphere, where even the most marginal of errors can derail a team’s campaign. Constantine, therefore, deserves praise for steadying the ship and rallying his troops to give their all to the cause. Before the year is out, India will have played Macao, Palestine and Myanmar again as they aim to consolidate their good form in the Asian Cup. Although there are a lot of positives for Indian football fans to celebrate, such as the gradual improvements made under Constantine, the problems currently facing Indian football are certainly not to be ignored and, as the manager himself alluded to in our chat, one of the main concerns on most Indian fans’ minds is the league situation that often dominates conversation on the terraces. Previously, the Indian Super League and the I-League took place at different times on the calendar which caused logistical problems as well as making it more difficult for Indian footballers to shine, especially since 2013 when the ISL began to steal all the headlines by promoting foreign stars and marquee signings from outside India. “At this point in time, it’s vital that more Indian players are actually playing games,” Constantine says. “The under-23s and the younger players need to be playing games, and having the two leagues will ensure that happens. Obviously, the long-term plan is for one league, but this is the best solution today. A dearth of young talent being nurtured along the production line is one of the key areas Constantine feels needs to be addressed if India is to re-lay the foundations upon which their football infrastructure has been built. Although he is quick to praise the improvements made by the AIFF, he is well aware that more can be done, a lesson that the money men would be wise to heed moving forward into the future. What stands out about Constantine most of all is his work-rate and overarching influence on the culture of football in the Asian country, which gives a strong impression that he enjoys being involved with India and shares a positive affinity with the place. Not only is he the manager of the senior national side, but he is also the under-23 head coach and has made no secret of his willingness to help out the under-17 side if needs be, too. Indeed, it was at under-23 level where he enjoyed a triumph by leading India to victory at the 2002 LG Cup in his first stint in charge – beating hosts Vietnam 3-2 at Thống Nhất Stadium in Ho Chi Minh City, a memory he recalls fondly during our interview. “India is an incredible place as are the people and the culture. People generally see what they hear about and only look at the problems but there is so much more to India than you can imagine. The arduous work has not stopped since. Although Constantine’s first three years in India were separated by 10 years and seven different positions as coach of Milwall, Malawi, Sudan, Rwanda and others, the London native seems to have always pined to return to his position as manager of the Blue Tigers. Overcoming Afghanistan 2-1 in the final of the 2015 South Asian Football Federation Cup was a turning point in the first year of his second spell in charge. India were on an unbeaten run of four matches – evidence that Constantine’s push to improve India with every game has been founded on hard work away from the spotlight. More importantly, it was a success that proved many critics wrong after a wobbly first few months. Having been appointed in January of that same year, the English coach had led his team to just one win from their first eight matches by the time October had trundled into focus. However, before the year was out, Constantine had re-energised his team and encouraged them to play better football; their poor form is a distant memory and they can now boast of having lost just twice in their last 15 contests. What’s more, they are on an 11-match unbeaten streak – 10 wins including an unofficial friendly victory against Bhutan and one draw – claimed the tri-nations tournament trophy, and will be eager to finish out the rest of 2017 unbeaten. When I ask Constantine about the forthcoming Under-17 World Cup, which will see manager Luís Norton de Matos lead a team into group stage battle against the US, Colombia and Ghana, his passion is once again evident. He feels that the squad’s togetherness is a big plus and is of the opinion that the event could be crucial in advertising India as a terrific place to invest in in the future. “The squad for the most part has been together for almost three years so I don’t think [a lack of togetherness] is an issue. Luís has been with them for about four or five months now and they’re together every day. Constantine always seems to have one eye on the present and another on the future where India is concerned, which is great to see. Undoubtedly his rapport with the country is a beautiful connection, made all the more striking by the current culture of money and fame that threatens to strangle the life from the professional side of the beautiful game all over the world. Here is a coach bulldozing a path towards sustainable development for a minnow nation when he is clearly good enough to make an impact at the highest levels of the game. The standout narrative from his story is that he has made the most of his opportunities to date, and India are lucky to have him directing order from the sidelines. While Constantine and India are a well-matched pair, it’s undeniable that he could well have found himself managing a top Championship or Premier League club in England if the instinctive reaction of many wasn’t to appoint ex-professionals or big names who simply don’t boast the same experience as a well-travelled coach like Constantine. “Look, I think this happens all over the world not just in England and you can’t blame the ex-players. Who wouldn’t want to stay in the game? It’s good to have former players as coaches. What I don’t like is the [English] FA making exceptions because ‘Player X’ played for a big team and he gets fast-tracked or is allowed to take over a club with a B License. That is very unfair to all the other coaches, ex-players or not, who have done things by the book. The coach himself is doing a great job, pursuing progress where he can with the players at his disposal, but it says a great deal about his character that he is thoroughly invested in the future of football in the country.